What’s Your ‘Freedom to Fish’ Worth? A recent lawsuit filed by the Gulf of Mexico Reef Fish Shareholders’ Alliance in federal court in Washington DC claims that the National Marine Fisheries Service (NMFS) hasn’t been restrictive enough with measures to punish recreational fishermen. While NMFS itself has been on the hotseat in Congress over recreational data collection efforts which were supposed to implemented by 2009, and delinquent stock assessments on red snapper in the Gulf of Mexico and South Atlantic, the Gulf of Mexico Reef Fish Shareholders’ Alliance is arguing that anglers are exceeding our annual catch limit of red snapper and claims that for more restrictive recreational accountability measures need to be applied. Click here to download a copy of the lawsuit filed by K&L Gates on behalf of the ‘shareholders’ – essentially, the clients of K&L Gates are hoping to turn the entire Gulf of Mexico reef fish complex into an owned and operated management program in which charter/head boat operators are forced to lease shares from the ‘shareholders’ in order to ferry customers to the fishing grounds, while also forcing a program of ‘fish tags’ on individual anglers in which they’d have to ‘pay to play’ a fish! The Recreational Fishing Alliance (RFA) fully understands what you’ve read in some of those glossy national magazines, how that there’s no national conspiracy by environmentalists to deny your right to fish. Meanwhile, the Chip Dillers at the national trade associations have been telling manufacturers that there’s nothing to fear, that all is well, and that there is no sinister plot at the legal, legislative or regulatory level to restrict your access rights. Well, when you read this lawsuit and go through five years worth of RFA bulletins, you might start to think otherwise. While the frat boys urge calm and provide emotional support for our federal government’s ongoing data collection initiatives (or the lack thereof), the recreational fishing industry in the Gulf and South Atlantic is bordering on complete implosion. Guess what folks, all is not well – in fact, as some stand with their backs against the wall, the recreational fishing community itself is getting steamrolled by the preservationist, anti-fishing agenda which is spending on average about $100,000 a month to cordon off the Gulf fishing grounds and place public fish stocks into private stockholder control. That’s why RFA is looking to raise $100,000 this summer with your help – imagine if what we could do with a $10 donation from every saltwater angler who cares enough about their freedom to fish to fight back. The Gulf of Mexico Reef Fish Shareholders’ Alliance are a group of commercial fishermen in the Gulf, specifically owners of individual fishing quota (IFQ) and red snapper ‘catch shares’ – who are themselves supported financially by the Environmental Defense Fund (EDF). The lawsuit through K&L Gates would force more restrictive accountability measures on recreational anglers in the Gulf of Mexico. An ‘accountability measure’ is punishment for catching too many fish; one such punishment is an in-season closure, another is a harvest payback of any overage. The final ‘accountability measure’ which would forever change the way we fish is the IFQ or ‘catch share’ for the recreational sector. Essentially, this federal lawsuit filed by K&L Gates and the ‘shareholders’ is a ‘winner take all’ legal battle that if won by the environmentalists and their commercial allies, will eventually put individual fish tags and recreational IFQ into place for the sportfishing community and destroy traditional open access for millions of American anglers. The plaintiffs in the case wish to turn the entire Gulf of Mexico reef fish complex into an owned and operated management program in which charter/head boat operators are forced to lease shares from present owners in order to ferry customers to the fishing grounds, while forcing a program of ‘fish tags’ on individual anglers. Don’t take our word for it, read the lawsuit! Consider the truly dangerous argument which K&L Gates attorneys Michael Scanlon and Timothy Hobbs make on page 18, section 62, in which they argue that recreational anglers should not be permitted to fish for any other species after the recreational red snapper season is closed, because we still may catch red snapper during those trips…that essentially is the marine reserve that groups like Pew Environment Group have always hoped for, but this time done via EDF lawsuit targeting the recreational fishing community specifically. 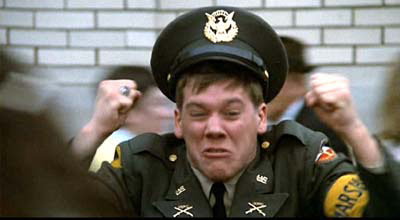 Consider the IRS records which show how EDF paid K&L Gates nearly $1 million in consulting and legal fees in 2011 alone. Then there’s the EDF ‘Action Fund’ which functions as the pure political lobbying arm of the parent organization and received an annual allowance of $622,000 in 2011 from EDF. No surprise, but the EDF ‘Action Fund’ also has listed K&L Gates has been on the receiving end of $411,143 for consulting and legal fees. The hired guns at this K Street lobbying outfit are being financed to the tune of approximately $100,000 a month to make their argument in Congress in opposition to open access. Regrettably, few members of the recreational fishing and boating industry have been willing to finance a counter-attack – and again, the RFA army stands alone. In 2011, it was reported that former Rep. James Walsh (R-N.Y.) was among the members of the K&L Gates government affairs practice who was advocating for the South Atlantic Fishermen’s Association, along with fellow K&L Gates staffers Darrell Conner, James Sartucci and W. Dennis Stephens. K&L Gates analysts Yvette Wissmann and Dennis Potter are also working on the account. The firm received $10,000 from the South Atlantic Fishermen’s Association between April 1 and June 30 for its advocacy efforts on behalf of catch shares, and another $170,000 directly from the EDF Action Fund during the first half of 2011. Walsh is a former member of Congress who joined K&L Gates in 2009, and had previously served in Washington DC a member of the House Appropriations Committee. 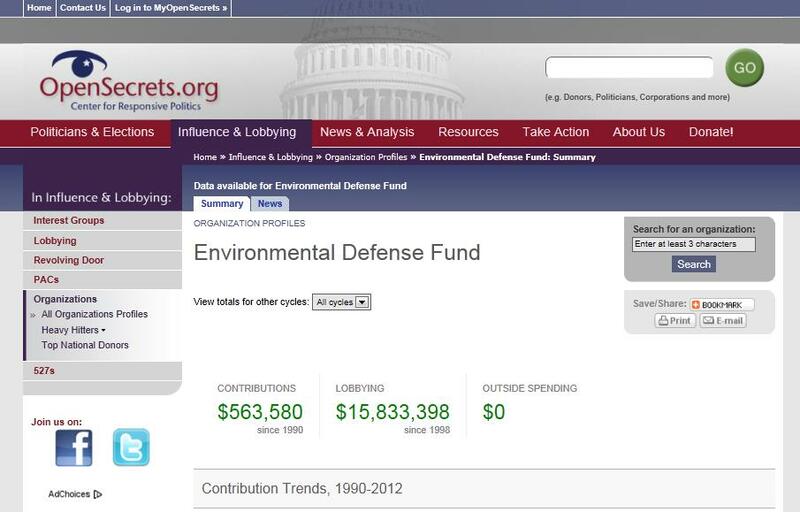 According to OpenSecrets.org, K&L Gates has made $90,000 through the first half of 2013 on lobbying exclusively for EDF and their EDF ‘Action Fund’ while accumulating more than $1.4 million from the groups for lobbying activities since the Magnuson-Stevens Act was reauthorized in 2007. There are many former members of Congress who are now working side-by-side with folks like Walsh to influence legislators into supporting the privatization of our coastal fisheries. Take former Rep. Sonny Callahan (R-AL) who earned more than $134,000 from 2010-2011 lobbying on behalf of the Gulf of Mexico Reef Fish Shareholders’ Alliance. The commoditization of our coastal fish stocks is big business, as K Street lobbyists are getting richer by the day, share owners are locking in their financial future, while the future ‘sharecroppers’ (recreational anglers) are being left at the docks. Timothy Hobbs, one of the lead attorneys in the new anti-recreational angler lawsuit filed on behalf of the Gulf of Mexico Reef Fish Shareholders’ Alliance is said to have a wide-ranging fisheries practice, which according to K&L Gates includes “experience with the legal and policy issues surrounding Individual Fishing Quotas (IFQs) and similar catch share management programs. Before entering the legal profession, Mr. Hobbs worked for several years in the field of fisheries conservation,” most notably the National Coalition for Marine Conservation (NCMC). As for Mr. Conner and Mr. Sartucci, their employers at K&L Gates also speak highly of their combined efforts “to improve fisheries management and conservation provisions, including specifically the implementation of catch share programs,” while also assisting environmental interests in defeating legislative initiatives in appropriations and authorizing bills that could provide improved flexibility to allow recreational anglers continued access to rebuilt and rebuilding American fisheries. K&L Gates specifically claims continued success on behalf of their environmental clients in killing any efforts in Congress to amend the Magnuson-Stevens Fishery Conservation and Management Act in order to preserve open access for America’s recreational fishermen. The Gulf Fisherman’s Association received $50,000 in EDF funding in 2011, the California Fisheries Fund received $160,000, as did the Charter Fisherman’s Association. Strangely, the Charter Fisherman’s Association (CFA) is a new group which claims to represent only charter fishing captains in the Gulf and South Atlantic, but they’ve actually been given financial assistance not only from EDF and the EDF ‘Action Fund’ but also by the Gulf of Mexico Reef Shareholders Alliance including a $48,000 start-up contribution. The obvious question of course is why a group of commercial IFQ holders in the Gulf, presently suing the federal government in order to punish recreational red snapper anglers, would financial support a charter fisherman’s association? The simple answer is that these EDF-supported groups want IFQs and catch shares for both sectors, commercial and recreational together, through a concept of inter-sector trading – the sea barons and the tenant farmers, to the exclusion of the American angler. 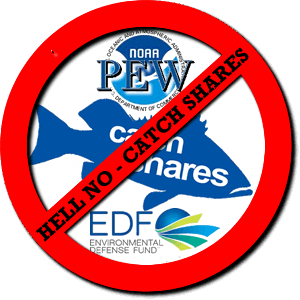 Environmental Defense Fund is going after your freedom to fish, that’s the bottom line. They’re well-funded and spending freely on big time Washington DC lobbyists. 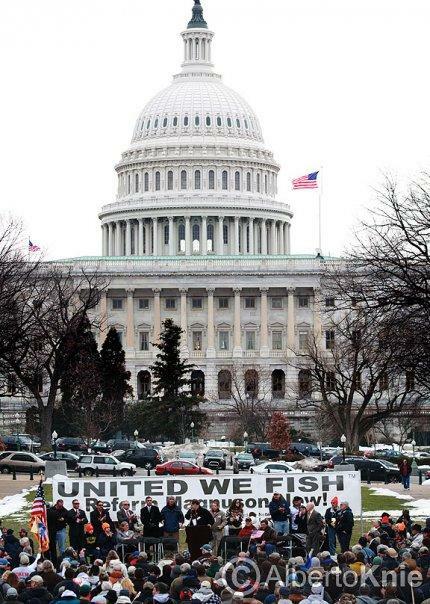 There are many members of Congress who believe in the message being spread by the Recreational Fishing Alliance (RFA) over the past seven years – they supported the national rallies at our Nation’s Capitol, and they truly wish to fight for your right to fish in America’s coastal waters. Some members of the recreational fishing industry have claimed that commercial catch shares won’t impact our sportfishing industry, even going so far as to publicly support a system of ‘fish tags’ for private anglers which could be bought at auction or through government brokerage houses. The political operatives at K&L Gates apparently are hoping that recreational anglers would be lulled into inaction by various fish summits, conventions and vision quests, because this new lawsuit could very well represent one of the final battles in the red snapper wars. The plaintiffs suggest a minimum of a 20% target reduction buffer to account for the management uncertainty associated with the Marine Recreational Information Program or MRIP. That equates to 5 days off the top of an already shortened federal red snapper season. What will happen to those fish? IFQ holders are hoping sell them back to the recreational sector! The problem of course is that the rest of our national industry has been Chip Dillered to near death. The so-called leaders of the fishing and boating industry have not been speaking up, and their customers – you the individual saltwater angler of the United States of America – are being told that all is well, to stay calm and not to worry. However, read the federal lawsuit, and look over some of the tax records from the various organizations now aligned with the IFQ movement in the Gulf of Mexico, you’ll undoubtedly realize how this fisheries management train wreck was first created by environmental design, purely as a means of selling the ultimate train repair kit (ie, recreational and commercial catch shares for coastal fisheries). The industry is divided, Congress has not been willing to act on Magnuson reform during the past 7 years, and the tacit support by some ‘sporting conservation’ groups for the EDF agenda has fractionalized our recreational fishing community. With this latest lawsuit, it is going to be that much tougher to defend our right to fish for Gulf red snapper in the future – unless you’re ready to fight back. So, are you ready to stand up and fight? Is it worth $25, $50, even $100 to have a group like RFA standing defiantly upon that wall, calling it as we see it, and defending your right to fish without compromise? Are you happy with the actions of Congress? Are you willing to let corporate shareholders and showroom environmentalists dictate the future of your fishing, and that of your children? What’s next after red snapper; black sea bass tags, summer flounder shares, recreational cod auctions? Is a $10 or $20 donation too much to ask to send a direct message to Washington DC that we will not give up our right of public access without a fight?